Over the years, I accumulated so much crap. I felt certain things held a sentimental value and so I held onto them. This was by far one of the largest hurdles (at least for myself) when moving into the van. Some of my stuff was really hard to let go of -at first. After dropping some of my more sentimental items, I realized I wouldn’t really miss them, nor have a need for them. This is going to sound super-cheese, but everything important to me was either in my head, or could fit into a backpack. In the weeks before moving into our van Zeus, I let go of things I’d been hanging on to for years and even decades. It felt great. We managed to make a pretty sweet pile of cash and made some people happy by handing out the remnants of our frivolous material stash. The first couple weeks in the van were anxiety-ridden and stressful. It’s a huge move, mentally and physically, to give up your own room or a large shared living quarters for 236 cubic feet of inefficient 70’s camper-van living. In the first weeks, we learned the true value of space. We ended up dropping even more of our stuff, realizing we were still hanging on to things we had no use for. We simplified and minimized everything we could. We were so into minimalism, that we started upgrading the things we did have to keep. Smaller, lighter, more efficient kitchen utensils, plates, bedding, towels, shoes, and clothing; a single jacket to rule them all, a high quality breathable sweater, several pairs of high-quality light hiking socks, etc. As a precursor to moving out of our static residence, we gathered all of our bills and monthly commitments, sorting through and tying up any and all loose ends. In doing so, we quickly realized how much money we would saving. Van life does have it’s monthly payment responsibilities, like a gym pass, maintenance fund, cell phone, credit card, etcetera, but we were able to drop hydro bills and rent, which felt like a huge step in the right direction. It’s truly amazing how much invisible stuff (also known as debt) we needlessly accumulate. Unsurprisingly, months into living the van life, we were realizing we really didn’t miss much of the old life. I mean, the sheer weight of rent and hydro being lifted was exciting enough, but there are so many more politics involved with renting an apartment, damage deposits and roommates that I will never again miss*. Part of the charm of living in a van is the freedom to hit the road whenever you want. Even for vandwellers living in a city, getting out is just that much easier. It just becomes a way of life. 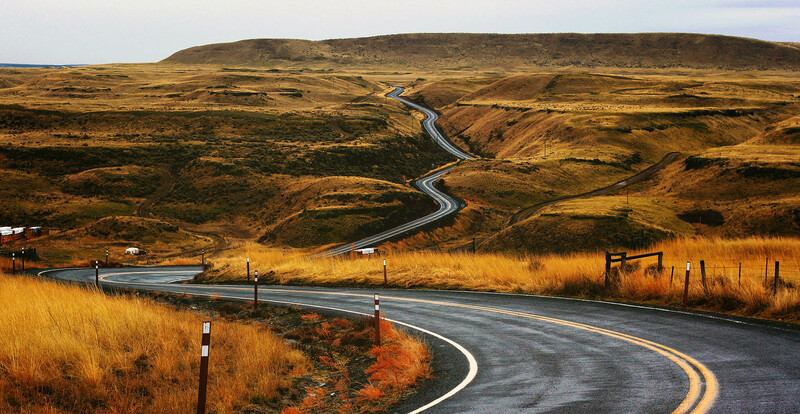 Roadtripping in your home-on-wheels provides an incredible stepping stone to adventure. Save on accommodation or go camping whenever and wherever you want; city, forest, suburbs or beach. At any point in your trip, you could stop and camp at that hidden gem of a lake you spotted from the highway, skip over the prairies in one shot, pull over for a comfortable nap in your own bed, barbecue, latté, cocktail, a bowl of cereal, whatever. This freedom is unmatched. If you’ve got your food and gas sorted, you now have the freedom to make your own schedule (assuming you are no longer on somebody else’s) with all of your bases covered. Having this flexibility is sure to keep your stress levels at bay. Nothing dampens the mood like a tight schedule or unruly itinerary while travelling. Sometimes, you just want to lay in your hammock, or listen to your favourite radio program, or just enjoy the silence, far from humanity, instead of meeting the rest of the tour group for salsa lessons around the pool. No hotel reservations, no rental car return times… if that’s your thing. If you have any interest at all in nature, architecture, urban planning, design, engineering, history, geology or the world around you, you’ll truly enjoy the view. The view is ever-changing, yet transforms whenever you want it to. Anyone who’s had the opportunity to find themselves far from light pollution can speak to one of the most amazingly mind-blowing views ever. The unpolluted night sky. I won’t get too poetic about this subject, but dang! This is something we don’t get in the city. 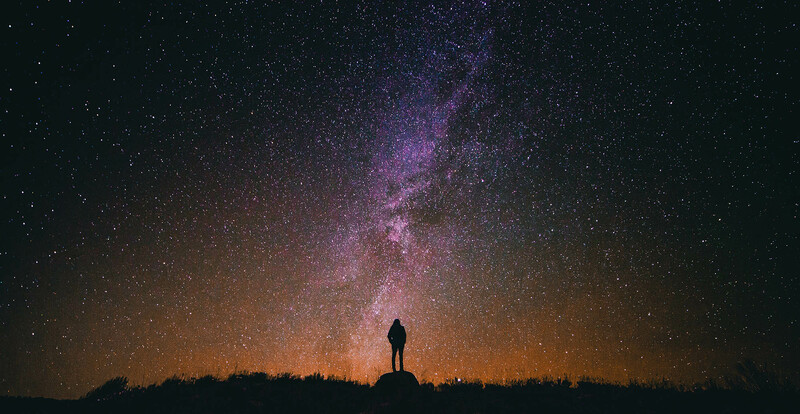 In fact, I’m sure there are many people who’ve never seen a true night sky in all their lives. Travelling by van is the only way to get a feel for the entire landscape. Every hill provides a new perspective, every valley – a new horizon. Driving away from the sunrise is a fantastic experience and one that will always remain with me. There’s something about hitting the road early, ready to see new things, feel new feels, and write new words. Of course, my daydreaming above only covers a fraction of van life. Most often, we’ll be driving through cities or between towns. This also provides an incredible view into the lives of locals, of history and of culture. It’s the perfect way to get acquainted with a new city of residence, get your bearings, and mentally map your next itinerary. 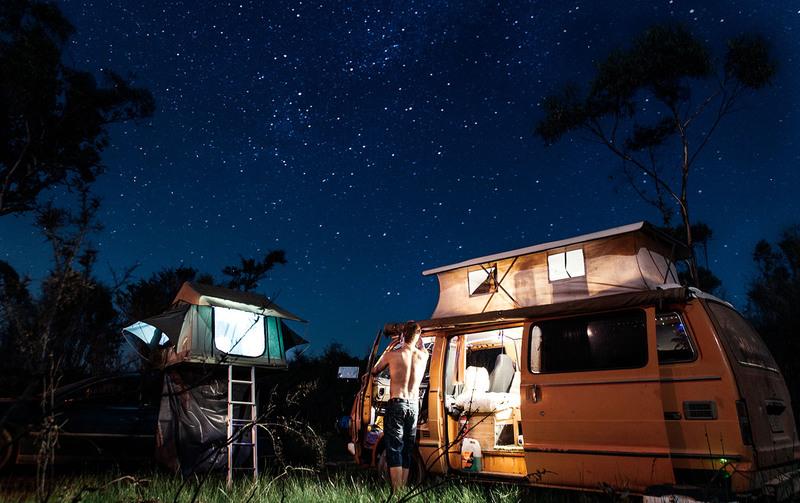 For those of us who enjoy camping, roadtrips, and travelling, van life is some next level living. We get the best of three fabulous and filthy worlds. For the sake of this article, I’m defining camping as strictly the act of parking your van somewhere to camp overnight. Whether you’re into the good old hiking, fishing and nature camping, or just pulling over for the night, it’s still an adventure. Camping in the city is not as easy or relaxing as camping in nature, but can still be fun once you learn some basic tips and strategies. 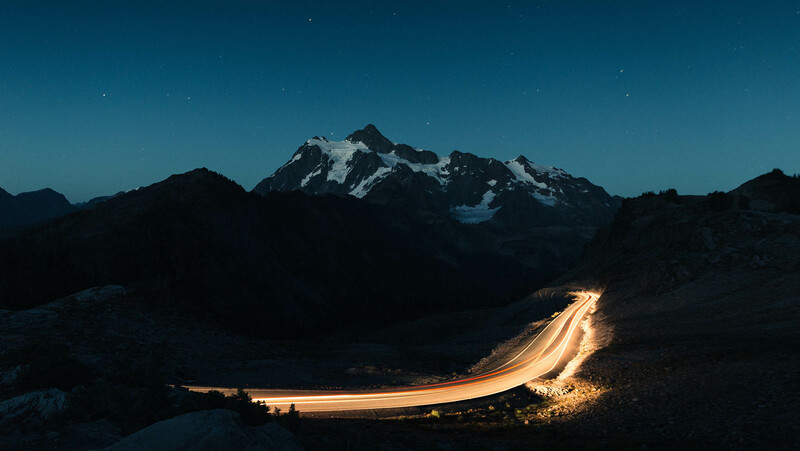 When we lived in our van in Vancouver, British Columbia, finding places to camp turned into a sort of game; finding the right combination of neighbourhood, parking spot and resources takes some practice, but it’s still fun (if you’re into that sort of thing). Camping in nature, in a van, is also great. You never have to worry about setting up a tent, a kitchen, or your bed. In the vanlife, you’re always good to go, as long as you’re prepared. During my massive roadtrip of Australia (consequently, in a van) we found campsites to be extremely hospitable, with a bustling culture of nomads, great cooking resources and relatively clean and available facilities. Pulling up in a house-on-wheels made everything about this experience work extremely well. 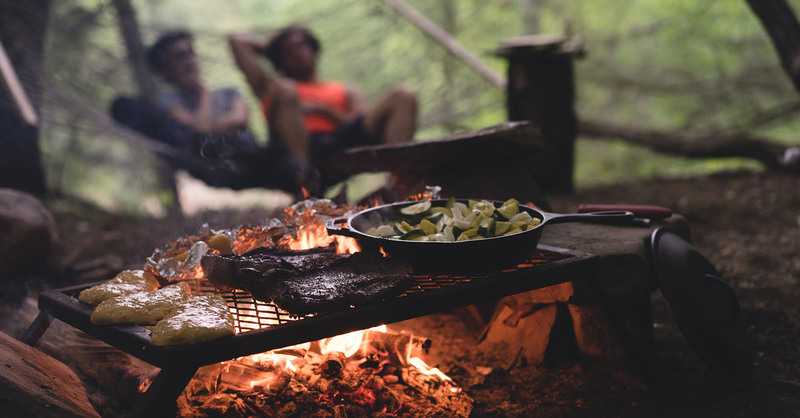 If camping is already your jam, you know what I’m talking about. If not, you’ll get there soon. I mean, it’s not all glamour. In fact, it’s never glamping (slap me), but it’s a hell of a lot more convenient than travelling across provinces, states or countries in a small car with a tent and I freaking love it. Pulling in to a town at 2am and choosing a parking spot is not cool. If you’re in a new place, it’s tough to judge a neighbourhood, scope the town and make a wise choice. Sometimes you just have to settle. Most of the time this works out fine, and you’ll end up making it through the rest of the night with no hangups. The best thing about this situation – if it turns bad – is that you live in a van, and you can just move. For the most part, you really can wake up where you want to be. If your camping spot is too noisy, you can move. If you don’t like the town you’re in, on to the next! All the vanlife-related glam on the internet includes waking up to beautiful views, feet dangling off the edge of the bed and out into nature. If vandwelling is in your future, this could be your reality. When my partner and I first decided to move into our van full-time, it was largely a financial decision. We were living in what is now one of the most expensive cities in the world, and we wanted to see how much we could save without paying regular rent, and enjoying the benefits of living in a mobile home. This lifestyle actually made us want to work less, so we could travel more. Long weekends got longer as the summer went on, and we spent more time outside the city, in the mountains, or by the ocean beside a campfire. 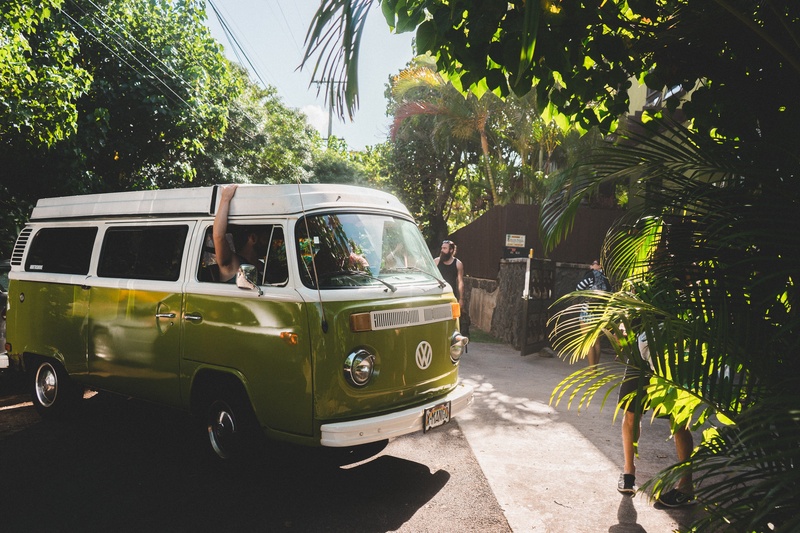 Living in a van truly is a cheaper way to go, and you did make the decision to move into a mobile home, so why aren’t you taking advantage of it? Come on, money is not all it’s cracked up to be (he said, doubtfully). There will be certain things you come across, like lack of a shower, or lack of a toilet while living this lifestyle. Consider your lack of facilities a slight disadvantage, but you’ll need access to a shower and washroom regularly (I think?). Since you’re already paying for that yoga membership, and you can shower there, you’re saving $1000 on rent! Wow, much savings! A van can be hard to keep warm, especially if you have a limited amount of power (to power a small heater per se). If there’s two of you, you’re at a great advantage. Body heat comes free of charge. A small amount of nutritional input which results in a good amount of heat output can save you thousands of dollars per year, (unless your live near the equator). If you’re dwelling in the winter, in places that are cold, finding somewhere to plug in can be hugely beneficial. Park in a friend’s driveway and offer to do a little work in exchange for plugging in at night to keep the heater running and charge your devices. This alone can be a huge boost, and can save another good chunk of money. Vanlife can enrich or destroy your life. It really depends on how you take it. Like most things in life, if you want to experience it – just do it, or you’ll never know. You’ll never know if you don’t try it. Travel, save money, go on adventures, experience culture (and subculture!). These reasons (among others) are enough to get thousands of folks like yourself into a van each year. If you’re still on the fence, and want to find out more about living this way, be sure to check out Vanageddon for van stories and experience, check out Our Open Road for immense amounts of inspiration, and follow the conversation in vandwellers for a large amount of very useful information on the subject. We have been out-of-van for a few years now, while we let our child settle into the world, and have definitely started consciously collecting debt and "stuff". Everywhere we go we still bring our lessons of minimalism with us. Even living in an apartment in a big city like Montreal, we don't have a couch, cable television (or even a television) and we sleep on the floor (don't worry, our daughter has her own room and a real bed). We've tried our best to keep it real but the debt still finds us. Every day we dream, plan, and save for our next big van life adventure.